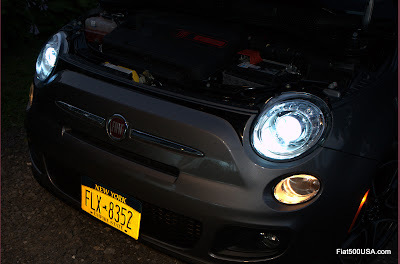 The headlights that come with the Fiat 500 are modern BiHalogen projector beam headlights. Using the latest halogen bulb technology, they put out a sufficient light beam, however, for those who want the ultimate in visibility, High Intensity Discharge(HID) or Xenon headlamp bulbs are the way to go. Up until a few years ago, Xenon headlights were only available on high end, exclusive automobiles, but are now slowly making their way towards more mainstream cars. One way this is happening is through aftermarket kits. These vary greatly in quality and run the gambit from Xenon bulb rejects found on eBay to kits made specifically for an individual vehicle. In the aftermarket and Car Tuner world, BFxenon is known for their high quality Xenon kits and excellent customer service. BFxenon supplied their latest kit available for the Fiat 500 for me to try. Connecting everything together is easy, Connectors are high quality and snap together. Here is a hint: Connector 4a on the ballast is marked + and - , make sure when you connect 4, the red wire is on the + side. This is the back of the headlight on the drivers side. Grab this cover and give it a twist about a quarter turn. The cover will come off. The only modification that needs to be done is to drill a 1 inch hole through the back headlight cover to pass the bulb wires through. I felt guilty about always borrowing my father-in-law's hole saws so I broke down and bought one. It measures one inch and can be bought at any hardware store. The hole is drilled out and I filed the plastic edges 'cause I'm obsessive about stuff like that. the built in grommet keeps it sealed. Here is a hint: Hold off sliding the wires through this cover until you have installed the bulb into the light housing. This will give you a lot more room to work with. Where you mount the ballasts are up to you. There are two criteria: The length of wire, and you shouldn't put the ballast where it will get excessively hot. For the ballast on the drivers side side, I bent up the supplied bracket and secured it with the supplied screws. The bracket bends up quite easily by hand so no problems. There is a location on the radiator shielding that has a hole already drilled. It is perfect and right next to this sensor. I grabbed a bolt, washer and self locking nut and fastened the driver's side ballast. Even during 100 degree weather, this location proved noticeably cooler than other components under the hood. Remove the old bulb by first disconnecting the grey headlight bulb connector. Then twist the bulb about a quarter turn or so and pull out. Sometimes it makes it easier if you push the bulb into the housing while turning it. Install the new Xenon bulb the same way. The trick with installing any headlight bulb is the bulb is keyed and only goes in one way. Evenly insert the new bulb into the headlight, line up the cutouts in the base of the bulb and twist it. If you have difficulty, make sure it is pushed in all the way while twisting it. This is the only potentially fiddly part of the job. Treat the bulb gently and don't touch it or bang it around. If you touch it, carefully clean it with alcohol and a lint free cloth. Once the bulb is installed, connect the grey headlight connector to connector 1 on the Xenon bulb. This is important: You may have to reverse the connector if the lights don't come on, so remember this. This is what the backside of the headlight looks when done. I used the supplied zip ties to tidy things up after I took these pictures. Do the same on the passenger side. There is a little less room here to mount the ballast. The best place I found is under the expansion tank. You just need to move the tank to get underneath it. Remove the one bolt and wiggle it out of its mounts. Lift it up and out of the way. Mounting the ballast under the expansion tank is easy. Test fit it to get your spacing right. I used 3M double sided moulding tape which you can find at any auto parts store. Put a couple of strips of tape on the ballast and push it down. The tape is fine and will hold it securely. Like the ballast on the driver's side, this location kept the ballast cool relative to other components under the hood. BFxenon has a variety of bulb colors available. I chose the 6000K color which most closely matches an OE HID setup. The lights have the usual Xenon bright white beam which helps on the mountain roads that I drive on. The headlights provide excellent visibility and improved the high beam performance. The high beam lighting is one area I've always felt the 500 could use some help in. Summed up, the installation went together well, with everything snapping together and other than reversing connector 1 there were no surprises. BFxenon was quick to answer any questions and provides a 10-Day Satisfaction full money back guarantee and 6-Month Replacement Warranty. *Disclaimer - The descriptions provided here are what worked on my car and I make no guarantee they will work on yours. Use at your own risk and I am not responsible if you damage your car. If you have doubts about your ability to do this kind of work, seek professional advice. Consult the appropriate authorities for the legality of installing aftermarket headlights.